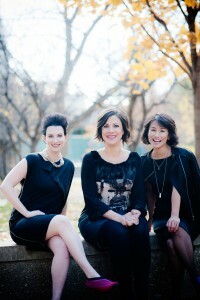 Well-established solo artists soprano Lindsay Kesselman, clarinetist Kimberly Cole Luevano, and pianist Midori Koga joined as HAVEN in 2011 around performances of Abbie Betinis‘ hauntingly beautiful song cycle Nattsanger. The group released its first album, Bright Angel, on Fleur de Son, Ltd. in 2013 to critical acclaim: “…amazingly performed works…performances are exquisite as is their ensemble chemistry.” (Sequenza 21) The trio subsequently released Atonement in 2015. HAVEN was awarded a 2015 Chamber Music America Classical Commissioning Grant and, consequently premiered and toured Jon Magnussen’s TWINGE throughout the 2016-17 season. This work is based on Pulitzer Prize winner Barry Bearakʻs “The Day the Sea Came”, the Nov. 27, 2005 New York Times Magazine cover story which tells the story of six who survived the 2004 Indonesian tsunami. HAVEN also received a 2015 Ontario Arts Council grant to partner with composer Kieren MacMillan and poet Dana Gioia for an upcoming premiere in 2017. This season includes performances in Kansas, Texas, Oklahoma, and Hawaiʻi, featuring HAVEN in a wide variety of concert settings, from high schools and universities to formal concert series, benefit concerts, and in private homes. HAVEN has ongoing and deep relationships with such composers as Kieren MacMillan, Evan Chambers, Abbie Betinis, Lee Kesselman, and Roshanne Etezady and seeks to create such partnerships with other composers. The group regularly tours across North America and believes in the exploration of multi-dimensional performances in which the audience is fully embraced and invited into the heart of the experience. Whether it is within a living room, an art gallery, or a concert hall, HAVEN seeks to invite audiences to engage with the intimate and powerful world of contemporary music-making so that all might emerge open to new possibilities, connected to each other, and transformed for the wider world.